Legumes is a large group of vegetables to which peas and beans belong. This group of vegetables has long been cultivated by gardeners for their soil improving properties. They absorb nitrogen and fix it in nodules on their roots which feed the soil as they rot down. Sweetcorn is, on the other hand, is a very greedy feeder.. 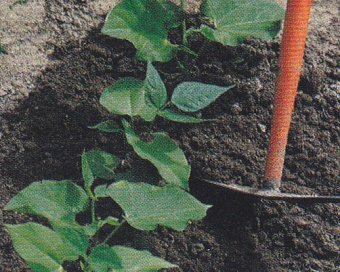 The seeds of French beans and runner beans should be sown into soil that was well manured in the previous Autumn or winter. They need warmth and moisture to germinate, so should not be planted until late spring when the ground has had time to warm up. Runner beans have very colourful flowers, so could well be planted in a flower border, they also look attractive when grown up a garden obelisk. Runner beans have stings running down the pod, which can become tough with age. New varieties of beans, including 'Delinel', are especially popular because they are stringless. 'Berggold', a yellow-skinned variety, is a tasty stringless bean, as is 'Opera', a Kenyan variety. Many of the new varieties are resistant to diseases including common bean mosaic virus, halo blight and anthracnose. between harvesting and sowing beans will vary, depending on bean type. In general, allow seven to thirteen weeks, or, up to sixteen weeks for climbing beans. By using these times as a rough guide you can gauge the number of plantings you need to make during the growing season. You will find that runner beans will keep on cropping throughout the growing season so there is no need to make successional sowings. 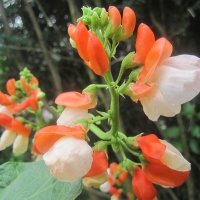 Just make sure you pick the beans regularly to ensure there is continuous flowering and, hence, continuous bean production. You sow runner beans from May to July, watering regularly to keep them cropping and harvest from July onwards. Saving Bean seeds: The best way to collect bean seeds is to allow the last beans on each plant - normally the highest that are too high to reach- to ripen fully. As they ripen they will turn yellow and look dry and shrivelled. It is at this point, pick them. Remove the beans from their pods and store in paper bags in a cool, dry, frost free place, labelling the bags so you know what you are planting next year. 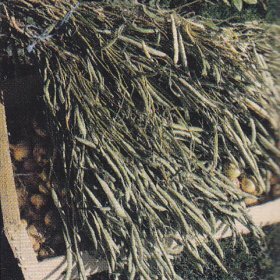 If you wish, you can also save seeds from peas and Broad beans, however, do not take seed from F1 hybrids because they will not come true to type, so really are not worth saving.